Armed with a bottle of Dom Perignon champagne our Member of Parliament, Robert Houston (Ben Miller) is about to celebrate his impending acceptance by the Tory Party to switch sides, leaving the Labour Party behind. This is a move to protect his status as a member of Parliament in view of an imminent election that Labour are predicted to lose. The MP's expenses scandal is about to break. It is 2009. The problematic situation goes back to Margaret Thatcher who recommended to MPs, rather than giving themselves unpopular pay rises way above the rate of inflation, they should embellish their claims for expenses to make up the shortfall. That was until an enterprising journalist started to investigate some of these claims which ran into many thousands of pounds due to the possibility of claiming the upkeep of a second home either in the constituency or near to the Houses of Parliament. Children and wives were appearing on MPs' payrolls and the home for ducks, the floating duckhouse island that cost £1,645 was a claim made by Sir Peter Viggers, MP for Gosport, who stood down at the 2010 general election. Tony Blair's expenses form was mysteriously shredded! Written by Colin Swash, a writer and producer of the BBC's Have I Got News For Youand Dan Patterson, the originator of Room 101, The Duckhouse is exactly my kind of word driven humour. The First Act is hilarious as Robert Houston tries to wriggle out of the impending visit of the senior Tory vetter, Sir Norman Cavendish (Simon Shepherd) and sacks his illegal Russian maid Ludmilla (Debbie Chazen). Ludmilla is bent on revenge and Robert has to cover up that his Westminster flat has been sublet by his son Seb (James Musgrave) to a Gothic decorator and a woman who delivers alternative therapies. Nancy Carroll is a sweet Mrs Houston but conscious of the better things of life, "Never again another glass of Jacob's Creek— we're Tories!" In the Second Act, too much depends on the client in a nappy joke as Holly (Diana Vickers) caters to the dubious sexual taste of a member of the Westminster hierarchy and the comedy pales somewhat. Some of the script has been written at the last minute as the spilt flour is used in a white powder joke to do with the court case of a famous television chef's alleged flirtation with cocaine in the past ten days. 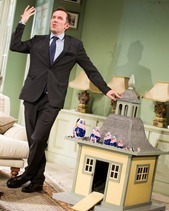 Ben Miller is a real treat on the West End stage and the whole cast act with verve and wit. Terry Johnson has given us a good comedy with as many witty lines as physical comedy and I found The Duckhouse thoroughly enjoyable. I suspect that if you are unaware of the British political scandals some of the jokes might miss their mark. Lez Brotherston's sets contrast nicely, the country mansion of the MP and in Act Two the huge Gothic skull designs in red black and white. And what became of the famous Gosport duckhouse? Having been designed to protect free range ducks from foxes by putting water between them and their prey, it was sold for 1700 pounds on Ebay and the proceeds donated to charity.